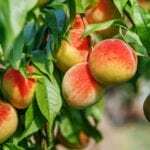 Tropi-Berta peach trees don’t rank among the most popular, but that really isn’t the fault of the peach. Those growing Tropi-Berta peaches rank them among the tastiest August-ripening peaches, and the trees are extremely adaptable. If you are seeking a new fruit tree for a home orchard and ready to bet on a promising but less-known variety, read on. Tropi-Berta peach fruit may win your heart. The story of the Tropi-Berta peach is a fascinating one, full of plot twists. A member of the Alexander B. Hepler, Jr. family planted a variety of peach pits in cans in Long Beach, California, and one of them grew rapidly into a tree with delicious August peaches. The L. E. Cook Company considered growing the fruit. They researched the temperature record in Long Beach and found it had only 225 to 260 hours of weather under 45 degrees F. (7 C.) a year. This was remarkably little chill time for a peach tree. The company patented the variety, naming it the Tropi-Berta peach tree. They marketed it in mild winter areas on the coast. But soon they discovered that the original tree was in a cooler microclimate and got 600 chill hours a year. It should have been marketed inland instead. But by that time there were many competitors for this market and the Tropi-Berta peach never took off. Yet, those in proper climates growing Tropi-Berta peaches love them and urge others to give the trees a try. You can consider growing this tree if you live in a mild-winter zone that gets at least 600 hours of temperatures at or below 45 degrees Fahrenheit (7 C.). Some claim it thrives in U.S. Department of Agriculture plant hardiness zones 5 through 9, but others say zones 7 through 9. Like most fruit trees, Tropi-Berta peach trees require a sunny location and soil with good drainage. Even in an appropriate location, however, Tropi-Berta peach care requires fertilization, both at planting and also for established trees. How about pruning? Like with other peach trees, Tropi-Berta peach care includes pruning to establish a strong framework of branches to bear the fruit load. Irrigation is also an essential part of Tropi-Berta peach care.